There's a certain satisfaction that comes from going to the airport dressed in your sailing clothes. A pair of new Sperry's on my feet, lightweight collared shirt, shorts, and a pair of sunglasses. And its snowing outside. People are bundled up, cursing the way winter hangs on in the Rockies sometimes, and wondering where I'm going. 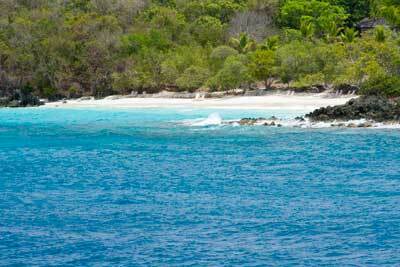 I smile as if to say, "I'm heading down to the Virgin Islands for a week of bareboat sailing with my wife." 85 degree weather, 80 degree water, steady trade winds, and hundreds of miles of crystal clear blue Caribbean water to sail on. My Mom graciously agreed to stay at our place for the week and keep an eye on our 6 kids, who only agreed to let us go on this trip without them because it was our anniversary. As Billie Holliday sang, "the things dear that I long for are few. 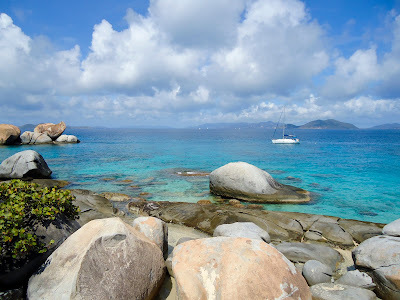 Just give me a sailboat and the moonlight and you..."
Flying to the Virgin Islands is no small undertaking. A red eye flight to San Juan, Puerto Rico, then a small hop to Saint Thomas in the US Virgin Islands, and finally a ferry to Tortola in the British Virgin Islands where we'll take temporary possession of a 36 foot Beneteau for a week of sailing. Following the advice of a dozen different cruising guides, we packed all the clothes we thought we'd need, then we took half of them out, and doubled the amount of travelers checks. That, we trust, is the right amount of 'stuff'. With all the swimming and snorkeling and warm weather, you really don't need much in the way of extra clothing. And secondly, with all the connections we really don't want to risk losing a checked bag. So everything needs to fit in a carry on. Given the weather down there, that really wasn't too tough. I even had room for my snorkeling fins! 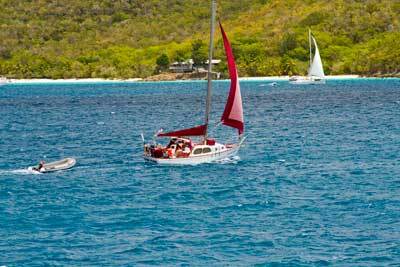 For a sailing trip, its best to pack everything in a dufflebag instead of a rigid suitcase. The reason being lack of space on the boat. For just the two of us it doesn't matter, the Beneteau has 2 cabins, so we decided to take rolling carry-ons that will occupy the unused berth. 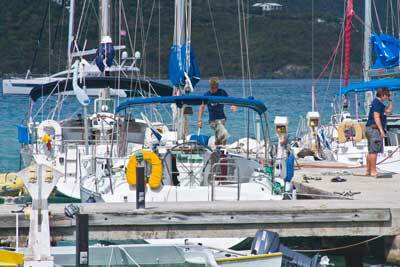 There are a lot of charter companies in the Virgin Islands. 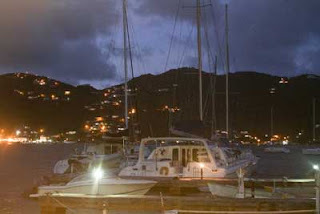 This time down we're trying Conch Charters out of Road Town harbor on Tortola. 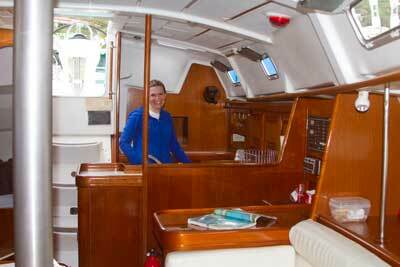 Conch is a second-tier charter company, meaning they charter boats that are 5-10 years old. We'd heard from several frequent BVI charterers that Conch was a great company and that their boats were in excellent condition (more on this later.) The advantage to Conch is lower prices than the companies chartering newer boats. 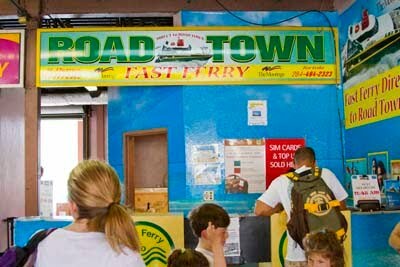 There are several ferry companies running between Saint Thomas and Road Town. We booked our ferry tickets ahead of time, along with connecting taxis. Conch arranged this for us, and it all worked perfectly. At each transfer along the way, someone was waiting with a sign with our name on it. The ferry ride was a great way to see several islands, great scenery, and dozens of sailboats lazily cruising through the crystal blue Caribbean water. By the time the half hour ferry trip was over, I was just dying to get out there and sail. We cleared customs in Road Town, where we met Conch's taxi. Conch's marina is a 2 minute taxi ride around the harbor. When we arrived, the staff was very helpful. They had already arranged delivery of our provisions from a local grocery store, and had everything ready for us. 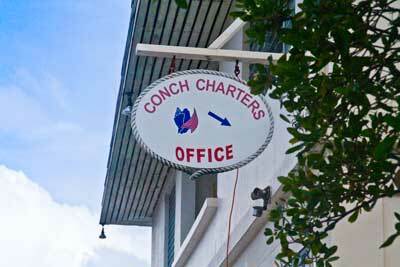 Conch Charter's office is over near the Fort Burt Marina in Road Town. The offices are small but adequate. We arrived early so we enjoyed lunch out on the lanai of the restaurant next door and watched as Conch staff members cleaned and prepared the boats for the incoming charterers. The docks were a beehive of activity as the crews went through performing maintenance, cleaning, fueling, topping off water, and changing out sails where needed. I was impressed with the high level of attention to detail paid to each boat. Conch is employee owned and operated, and their engagement shows. As night fell, the lights around Road Town harbor decorated the hillsides. We ate dinner on shore and watched the boat rocking gently at the docks. The peaceful, warm Caribbean evening gently washed away the day's travel stress, welcoming us to island life. Such a cool place. Nice to experience.